Looking for debt relief ideas to pay off that holiday spending spree? Read on! Christmas is a wonderful time of year where we spend time with family, friends and loved ones. It is also a time of great stress for some that decide to overspend during the holidays. Christmas debt is the one part of the holidays that Santa Claus can’t really help you with. Instead it will take some common sense strategy, planning and discipline. Here are some ideas to get that debt relief so desperately needed after the holiday season. Like any other debt, holiday debt is all about the interest. Retailers are quick to give you items on credit as long as you are willing to pay exorbitant interest rates later on. Lay out all of your debts and list them by the amount of interest you are going to owe and at what rate. Knock out the highest interest debts first and pay the minimums on the low interest items. Once you pay off one, move on to the next one till they are paid off. The best debt relief ideas advice I was ever given in life was to make more money when I can’t pay my bills. Seems rather obvious but making more money rarely comes to mind for people. The thought of taking on another job often is not an option mentally. The truth is, we all can work a bit harder if we need to. Consider a side job for a few months to pay off that debt. If you have a computer and even a modicum of free time, you have the means to start a home based business. Spend a few hours per day building a website. Learn how to do data entry or run some auctions on ebay. All of these things will put some extra funds in your pocket and knock those holiday debts down to size. Of course you can’t ignore the payments but you can certainly eliminate extra amounts being added. Have a trusted friend hide them or simply cut them up if you can’t control yourself. To eliminate debt you have got to stop adding to it. If you want to truly get ahead and are not willing to increase your income, you have to instead stop your flow of outgoing cash. The best way to do this is to cut corners where you will feel it the least. Entertainment is an easy target because there are tons of things you can do that cost absolutely nothing. Spend some time on a nature hike, play a sport, exercise or simply walk through the park. Commit to a no-spend month or two and you will find your holiday debts are shrinking even faster. Coming up with debt relief ideas to pay off Christmas isn’t that hard. Simply work on paying down the highest interest items first, find some ways to make extra or stop your spending until you get ahead. These basic principles are good the entire year round. 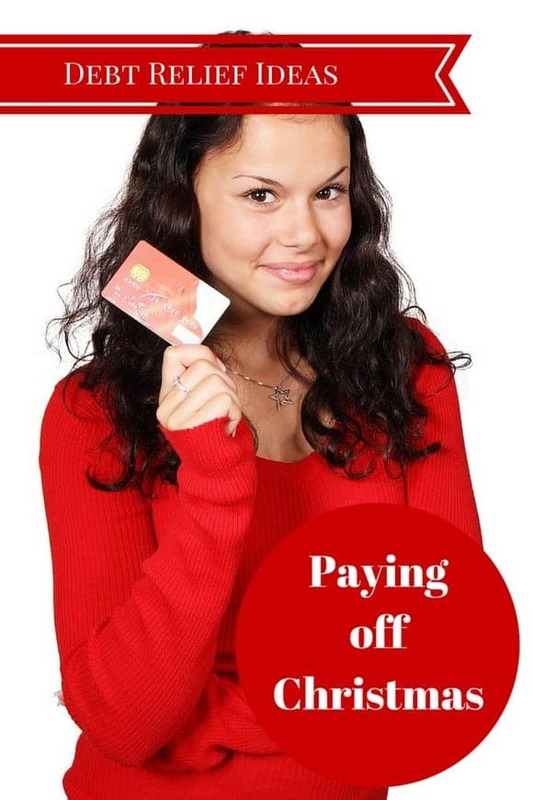 Do you have any other debt relief ideas to pay off Christmas? Share them in the comments! Great tips! We try to pay off our credit card as soon as possible and then don’t use it for several months after! So timely and great tips – first one is what we always do when carrying debt. Great tips for getting out of debt! We were in debt there for a while after we got married, because we were both full time students with only 1 part time job that barely covered rent. So we lived in Credit Cards for food and utilities, we didn’t even do anything luxurious. But those bills were such a burden. And then we he finally did get a good job, all our money went to paying off the credit debt. It was such a dark time. Now, except for medical bills, and our mortgage we are free of debt. No credit card debt at all and it is such a feeling of relief. We have credit cards for emergencies, but we do all we can to never have to use them again. Just paid off some of my credit card for Christmas gifts the other day. I plan to have it all paid off by next month! I buy all year long when I find great deals and hold them to the side for Christmas and birthdays that way it does not hit my credit card all at once. I attack the smallest debt first, then take the payment I would have made on that one and add it to the next-highest, and so on until you’re throwing all of those extra payments at your biggest debt. You’ll knock it out in no time! I like to follow the no cash no buy rule. It helps me control my impulse buying. Great tips and reminders for sure. I like the idea of a no-spend activity budget. Sometimes we feel obligated to spend money just to have fun! We are currently debt free except our house, which we are working on. We do not use credit cards. This helps us not spend money we don’t have. Great tips and so important! I love the one- forget that credit cards exists. Financial freedom is so important to overall health.